In my family we love eating together – our whole entire lives revolve around eating. Breakfast, lunch, dinner, midnight, the time doesn’t matter, as long as were eating, together. For their entire marriage my grandmother used to prepare a ‘snack’, aka an entire meal and a side of whisky, waiting for my grandfather on the table when he got home from work. Us girls sure know the way to a man’s heart! As you know we are Jewish and this plays an important part of our lives too – what’s great about it is that it encourages us to eat! Every Friday night we have Shabbat dinner, and then on Saturday we do it all over again over lunch. Typically, on Friday nights we eat meat and at Saturday lunches we eat dairy which I love because it gives me a chance to try out all different kinds of recipes! 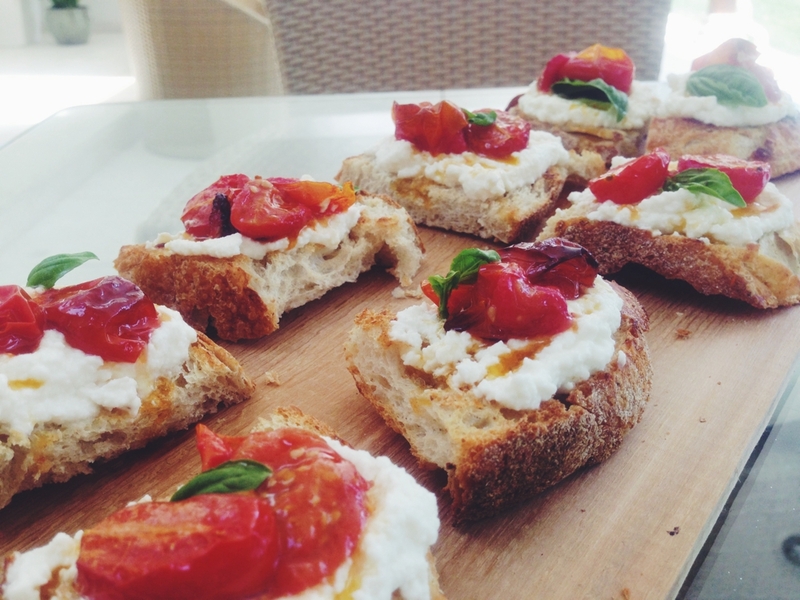 Last weekend I found some delicious looking Ricotta cheese and of course lunch sprang to mind. I wanted to make something light yet substantial, with a lot of flavor, and we all know you amazing roasted tomatoes are. This is great as a side, snack, or a main along with a bunch of salads. You could even make them mini and serve them as canapes. Enjoy! Take the tomatoes wash and dry them well and sprinkle with a little salt and olive oil. Roast them for about 20-30 minutes until they are soft and maybe browning a little. While they are cooking, spoon 1 1/2 tablespoons of ricotta cheese onto each sourdough toast. Top with the roasted tomatoes, and the oil they were cooked in and 1 basil leaf. Can’t get easier than this… They look delicious!! These are great for easy entertaining! Mmmm, yum. Sounds delicious, and I love to hear about your religious rituals too! Growing up I always wished I could be Jewish, or from a big Italian family or something like that. Alas, I remain an Irish Catholic and deeply jealous of other people’s wonderful cultural heritage. Thank you so much Sarah, it sure is a lot of fun!